Starting an update to any area of my home is typically triggered by a change of seasons or special occasion, i.e. Easter, Thanksgiving or Christmas. Sometimes it’s a special occasion called boredom that is the incentive and a new look is necessary to highlight a favourite item that has been out of sight for too long or I want to play “interior designer”. Whatever the occasion or reason, I start by ‘clearing the decks’ and cleaning the area (while dust bunnies are cute, they have no place in decor!). This enables me to see the space anew and clearly and allows me to consider the space I have to work with and what might fit. I place the larger items first as they are the anchors in the display. I use the ‘rule of odds’, that is, an odd number of items bring balance to the display. Typically this is 1, 3, or 5 but can be 7 or 9 depending how large the item is. For example, if you collect salters which are smaller items, displaying 7 or 9 can be attractive and not too cluttered or overwhelming. However, it you collect antique crocks, displaying 7 or 9 would be overwhelming and crowd the space. 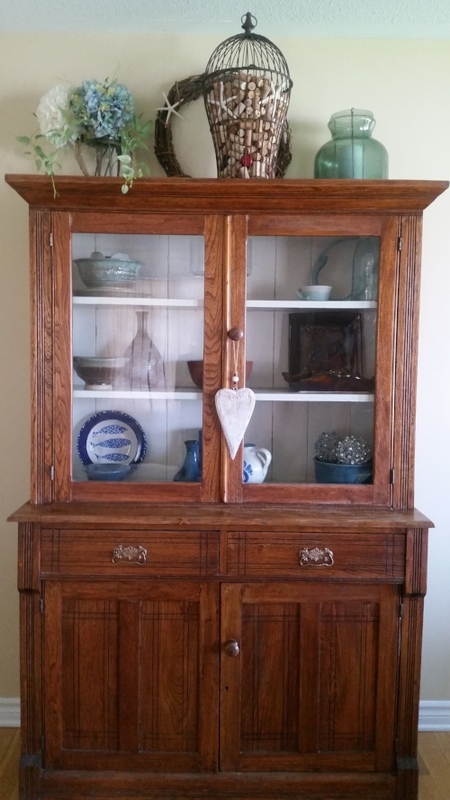 In the case of my hutch, I used 3 larger items as the anchors and built around them. In order to highlight or feature a particular item, it is important to have some negative or blank space around it so it stands out. Often we crowd our vignettes and it ends up drowning the display and is difficult to see and appreciate the items we have included. Remember that ‘less is more’. The addition of the grape vine wreath works well with the wrought iron in the bird cage and the hydrangeas and vine add texture and coordinating colour. Texture is critical in design and decor, especially when creating a display. Without it displays (and rooms) look flat and one dimensional; layers of texture are necessary to create movement and interest and bring vitality. The sea grass and sea glass jar seemed a bit too much of the same colour so I added the star fish to bring a splash of white and an added dimension of texture. The most important part of creating or styling a display is to have FUN! Style, re-style, experiment, play with the display. It costs nothing to keep moving things around until you have a look you love and is gorgeous in the space. And be sure to share pics of your results in the comments section - I love seeing the results of your work!